It may seem strange to have this as our theme for this month, however, we’re taking a different spin on it. Rather than listening to our negative thoughts, were going to call them out for what they really are: balderdash! Most, if not all, of our negative thoughts appear immediately after we’ve said something forward moving or positive to ourselves. For instance we might say to ourselves, “I’m going to call ____ to talk to her/him about ______.” The immediate negative thought might be “s/he doesn’t want to hear what you have to say” or “s/he might get mad at you or think you’re stupid for calling” or “why do you want to that?” or some other such negative or fear-based thought. When we let these negative thoughts go unchecked we tend to change our minds and do something else only to have to face it again another day. If we let this happen often enough it becomes a habit, leaving us wondering why we seem to be stuck all the time. When we recognize the nonsense for what it is and follow through on our truth, we then move forward and change our lives for the better. 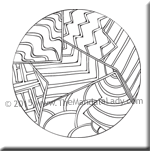 Ponder this as we color this month’s mandala. Be sure to check out Section 10 of the 2015 Mandala of the Year.